If your jaw pain is getting worse, it’s important to schedule a visit with our practice. As your oral health experts, we care about more than just your teeth and gums. Have you ever woken up with a locked jaw that is difficult to move? Or how about jaw pain that seems to be deep and only getting worse? It’s important to get ahead of a serious jaw problem before it’s too late. Take a look at these five common causes of jaw pain. 1. Teeth grinding. A popular problem that many people don’t know they have because it can take place during sleep, teeth grinding involves tightly clenching and moving your jaw. Causes include stress or anxiety, specific diseases and even side effects of medication. If you suspect you may be grinding your teeth, try sleeping with a mouthguard specially designed for nighttime grinding. 2. Temporomandibular joint disorder (TMD or TMJD). 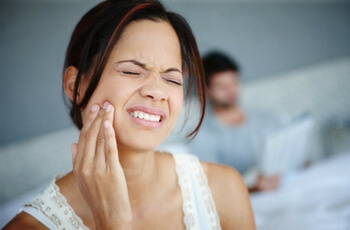 If your jaw pain is associated with restricted jaw movement, you may be dealing with temporomandibular joint disorder. Other symptoms include tenderness in the jaw joint, face, ear and even the neck and shoulders as well as a “clicking” sound upon opening or moving the jaw. An oral exam can diagnose TMD. 3. Impacted wisdom teeth. Typically, wisdom teeth erupt between the ages of 17 and 25 and can cause trouble in your jaw—especially if they are impacted. Wisdom teeth can become infected and bring on acute swelling and pain. 4. Untreated cavities. Experiencing a cavity in one tooth doesn’t mean the pain will remain in that specific area. If a cavity goes a long time without being filled, an infection can develop and spread, causing pain in the jaw and other teeth. 5. Gum disease. Gum disease is often caused by poor oral health and as it progresses, can lead to problems with the tissues and bones that support the teeth. If you’re experiencing jaw pain that isn’t subsiding, we recommend scheduling a visit to our practice. We’ll help identify the problem and recommend a solution that’s effective for your needs.